Do you enjoy getting dressed? Identifying your own personal style and then playing with it is fun! You can learn to create your own style statement here. The five words I chose to describe my personal style statement were; artistic, unique, relevant, fun and strong. This dress has fun, unique and artistic covered. Your clothes should make you feel happy regardless of age or weight. If they don’t you need to rethink your wardrobe and your internal dialogue. 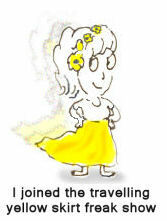 We often restrict our style choices due to self limiting beliefs instilled in our minds from an early age. For a deeper look into this check out Sherry’s brilliant post about building a spine in a backless dress. Making an honest effort to confront these beliefs by challenging ourselves through experimentation moves us past our negative internal voices and allows our authentic selves to shine through. 1. Thrifting is the all time best way I’ve found to allow me to try out new things, experiment and find clothes that make me happy. You don’t have to drop big bucks to experiment and try something new. If it doesn’t work in the end just re donate it. Added bonus…you’re a super hero! You aren’t depleting the earth’s limited resources. You are buying secondhand clothing and recycling pieces that might otherwise end up in a landfill. 2. Knowing your body shape is important to choosing clothes that will make you feel good about yourself. Sylvia has some great posts on identifying your body shape. 3. Choose the correct size for your body shape and type. We all want to fit into a size 2 but only a few of us actually can. Accept your size and move on. 4. Assess your weaknesses and your strengths. Do you have great ankles? Go for flashy shoes. 5. Choose clothes that you love. They are guaranteed to make you happy. Don’t worry about any fashion rules. Follow your heart. 6. Choose colours and patterns that you love. If you don’t like patterns you probably won’t like wearing them. Same goes for choosing colours to wear. Confidence is the difference between looking amazing and looking ridiculous. If you don’t think you have the confidence to pull off what your heart desires yet fake it. Like night vision it takes our eyes a little while to adjust to our new selves. Changing our personal style requires an adjustment period. Understand that you are worthy of wearing whatever you want. Our clothing can shift the perception of ourselves. Our chosen second skin is an opportunity to make positive changes. Giving yourself permission to dress as the person you aspire to be is the beginning of the change you want to see in yourself. Every time I come across lovely dresses like this one when thrifting they make my heart skip a beat and I get excited thinking about how I’m going to wear it and what I’ll pair it with. It is just so darn cute. The ruffle neckline, the fit and flare the polkadots! Seriously! What’s not to love? I knew this dress could really hold its own so I paired it with a blue wig just for fun. Why not? As adults we often forget that we can take some time to just play around. Practical has its place in the adult world but never forget the power of allowing yourself to experiment and enjoy. Making some time to do this can be as therapeutic as meditating. I liken it to when I’m painting or drawing…I get in “the zone”. You allow yourself to really focus on the moment. Life opens up and all we see are possibilities. Several bloggers such as Judith, Mel and Debora describe the way they choose outfits as using their bodies to create art for the day. I’m creating art with Zoë. I fashion with polkadots and flowers and she designs wearing furry pants leaving a hairy trail in her wake. We’re the perfect couple. 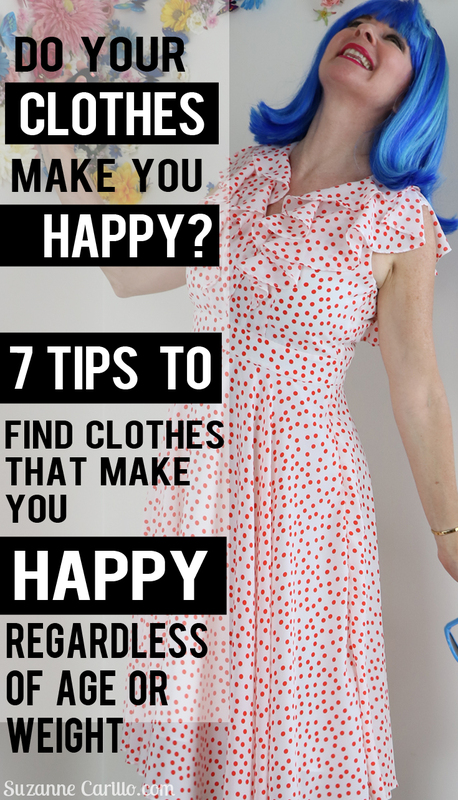 How do you choose clothing that makes you happy? 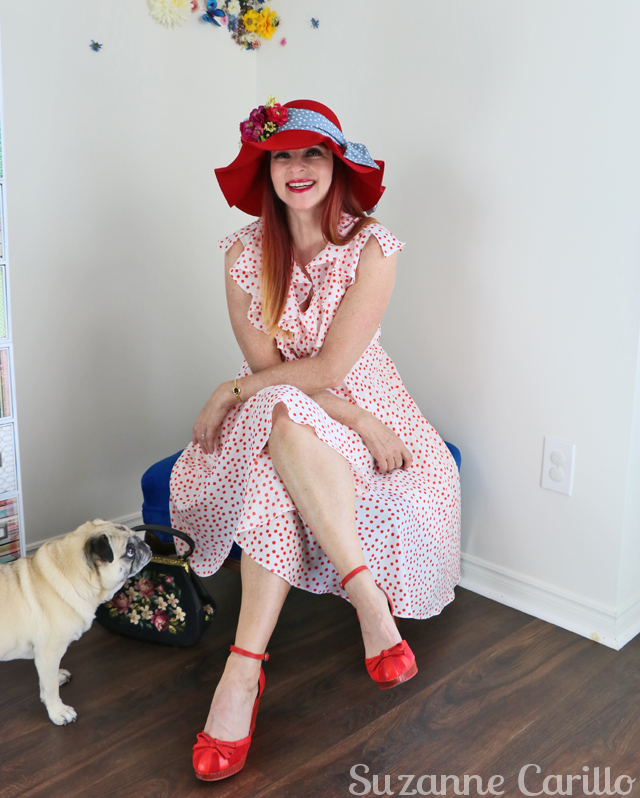 Linking up with the lovely Patti over at Visible Monday and Judith at Hat Attack. I love thinking of getting dressed that way—use your body to create art—that’s so fabulous!! And we should love our clothes since we have to wear them everyday!! It would be like eating food you didn’t like otherwise, and life is way too short for that!! That blue wig is quite the smile producer, Suzanne!! I keep thinking that once my hair goes all white, I want to dye it green or pink—but then again, maybe I’ll just try a wig like this?? You would look amazing in pink or blue hair! Before I went red I was blue and purple. Not 100%, but bits and pieces. I liked the blue the best. It brought out my eyes. 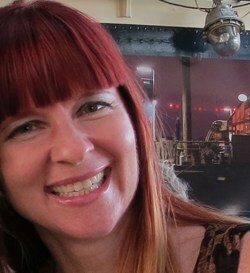 I’ll have a hard time leaving behind my red and returning to my blond roots one day. By that time it’ll probably be white roots. Thought provoking post Suzanne. I’ve always tended to associate clothes happiness with size happiness. I love the idea of clothes as an expression of art but while I have the ideas, I don’t have the confidence. But you’ve given me food for thought. I sometimes can fall down that dark rabbit hole of blaming unhappiness on my weight. The reality is what we make it. Our attitude towards ourselves is everything. Although I’ve been adventurous in my style since I was a teenager I always suggest baby steps for other people that aren’t accustomed to it. Well, I dont create art, but I love what I wear!And one day it s elegant and the other it is with a little edge! Wearing what you love is what is truly important. I totally agree with you, style is about knowing ourselves and regardless of weight, age or height, fashion translates who we are, for sure. I loved Zoe in the picture! I also loved your dress, shoes – red, I love red! – ans the bag is sooooo sweet! Long ago, there was a time i didn’t like patterns, but I am such a fan now. We evolve, our styles change, for sure. I like to recycle my own pieces, and this helps the planet, I suppose. You are right about thrifting and confidence and you always look so fabulous! Bisous! I agree…styles change as we change we evolve. This is such a positive, uplifting post. I love it! The blue wig, hahaha! It’s looks great on you, but anything would look great with that awesome dress. You know better than anyone how to find happiness in the closet. I should have named these photos as my ode to you! Ha ha! Another well written and relevant post about style and how to make the most of one’s wardrobe. I love to buy thrifted clothes and agree, the lower price can be good to experiment with! I LOVE THIS DRESS ON You, THE HAT is gorgeous too. Oh and the blue wig, how fun !! What a great post! You have given me a lot to think about. It can be tough for the less visual and more linear thinkers amongst us! Lovely blog! As a creative person I have to remind myself that not everyone can see the possibilities that I do. I do believe though that the more that you practice or try something the easier it gets no matter how your brain is wired. Okay that may be BS. I will never understand calculus and I’m okay with that. This is such a great post Suzanne! As I’ve moved away from thrifting towards sewing my wardrobe, I’ve lost a bit of the happy in my closet. Not a lot…nothing to get too worried about, but your post is a good reminder to me to try a little harder to think about the finished garment and ask will it make me happy. Sure, it’s harder to do than than standing in front of a mirror in Talize, but I can do it now that I’m really aware of it. I am always amazed that you are able to visualize the finished garment before you start. 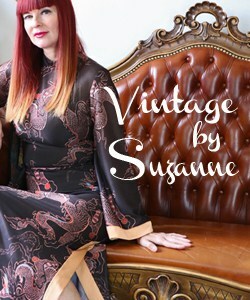 Suzanne, that dress looks so darn cute on you. Love the hat and shoes too. The blue wig is a fun whimsical touch. You wear that hair color well! My pug knows in order to get my attention to feed her she needs to get in front of the camera. I can really tell that you enjoy getting dressed Ann. Your clothes always look like they belong on you and only you. You’ve nailed your style. I agree that we don’t feel as comfortable if we choose the wrong clothes. I also think that in style blogging we are often influenced so much by others and sometimes feel a need to emulate other bloggers that may be more successful thinking that possibly that will help our success. Of course that never works. Remaining true to ourselves is the only way to feel good in our skins. You look gorgeous and happy and confident. Zoe’s adoring little pug face says it all. That is why I love your blog so much! Well that and your badass attitude. Ha! Another excellent post, Suzanne! The suggestions you offer are pretty straightforward , and yet I am always surprised at the number of people who don’t think of these things. I guess that is because I surround myself with women who are already aware of these tips and have put them into practice. As far as choosing clothing that makes me happy, I have a fairly clear idea of what shapes and styles I like and if I put something on, and I immediately start to twirl, dance, or strut, then I know it is a good outfit for me! 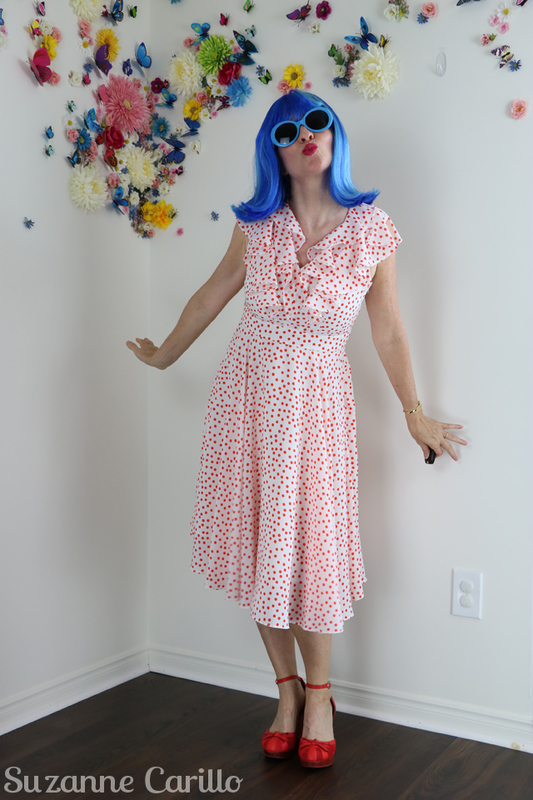 Your outfit is lovely, and the blue wig is the perfect accessory to add a bit of KAPOW to any outfit. When I was writing these out Shelley I also thought they are just common sense but in reality that is what 99% of everything we read in self help books is…common sense. People just need to be reminded sometimes…myself included. I am inclined to say Amen. As I fully agree with you. And that dress is indeed too cute to be true. And so your style. You look picture perfect in it. 🙂 I love the pictures, Suzanne! Great! It was a very fun photo shoot. That dress and wig just make me smile. I love this post! Fashion can and should be fun. You capture that here. The photos are as good as the prose. You’re rockin’ that blue hair! I like everything about you, Suzanne. You’re such a fun person. Being comfortable also means dressing age appropriate like avoiding short skirts, exposing my midriff and wearing uber high heels. While others might be able to pull it off, I am just not that motivated. I adore that image of you in the blue hair – that one is a keeper! It is terribly tempting to pick up items because they are cheap when you thrift. Thankfully I’m getting better at this. As I age I find that I cover up more. About 5 years ago I went and shortened all of my dresses and skirts. About 2 years ago I went back and lengthened them all again. Ha! Wigs are the best. I just wish they weren’t so darn hot. I’d wear them more often. That dress is too cute! Also, LOVE the blue hair. 😉 I’m all about wearing only what you love and not even bothering putting clothes in your closet that you don’t love in the first place–because you’ll inevitably end up wearing them and wondering why you don’t feel great in your clothes! I agree. Plus closet space is prime real estate and should be saved for only happy vibe clothing. I absolutely agree! Wear what makes you feel happy! If you do then others will see that too! I like your idea about thrifting to try something new as you are right you can always donate it back! Makes a lot of sense and no waste! You look absolutely fantastic in that dress and I adore the blue hair! Not only is this outfit stunning–and that blue hair!! I want it!!! But this whole post with its spaciousness for play and focus on the positive–what looks good, what feels good, what best expresses who I am–this is The Best message for all of us. This post makes me happy! I absolutely agree and love this post!, if you print some of your tips on (colorful) t-shirts, I would buy them!. Love your wig, love your hat, love your cute sunnies, and love your charming personality and fabulousness!. You’re gorgeous! ‘Understand that you are worthy of wearing whatever you want’. A big Yes to that! !, embracing our own personality, our own creativity and fabulousness, that’s the way to enjoy fashion, enjoy live and have fun! You embrace your own personal style so passionately and make it seem so effortless. 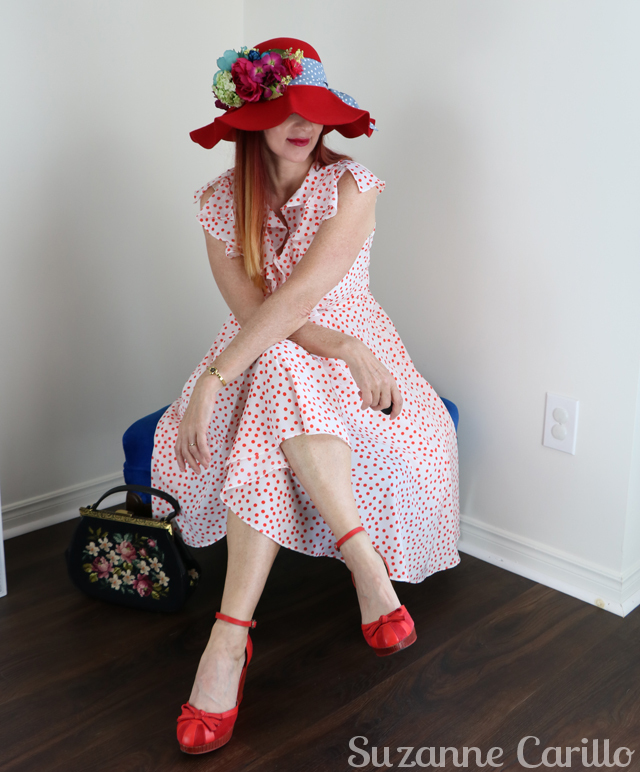 The addition of the polka dot and flowered hat band makes your red hat look so fun and festive! Thank you for the link and thank you for sharing with Hat Attack!